Points West Community Bank has seven branches in Colorado and hundreds of surcharge-free ATMs through the Star network. Its small business offerings include business savings and checking accounts, lines and loans, and commercial and agricultural financing. It is rated A+ by the Better Business Bureau. Ready to get started with Points West Community Bank business checking? Apply now. Points West Community Bank has seven branches in Colorado and hundreds of surcharge-free ATMs through the Star network. You can use its branch locator to check which locations are closest to you. 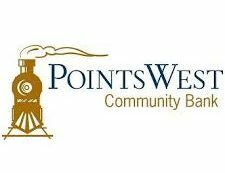 Points West Community Bank also offers the following business services: business savings accounts, lines of credit, small business loans, Small Business Administration funding, commercial real estate and construction financing, and agricultural and livestock loans. Although it offers personal money market accounts and credit cards, it currently does not have a business money market account or credit card offerings. Find out more about its small business offerings on its website.